Code 800A0046 is a straightforward error to solve. 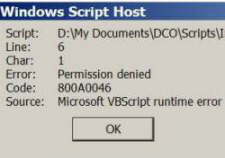 The secret is to read the Windows Script Error message carefully, then check the access control list to see who has permission to use the page, or use the device. Code 800A0046 is runtime error that is more likely to occur with an .ASP file than a .VBS. You could be trying to connect to SQL, IIS or Exchange. However, my example of is taken from printer permission problem sent in by Keith S.
When you get a pop-up message box. Put on your detective hat, and pay close attention to the line number. Error 800A0046 is a runtime error, so the problem is likely to outside your script, there could be something the matter with permissions on an application server. In the example above, Line 6: is the source of the error. Char 1: is not always very useful as the error could be anywhere on the line, and WSH still blames char 1. The cause of error 800A0046 is likely to be read-only permissions on some aspect of your server. The Source: tells us that this is a runtime error, therefore the syntax is probably o.k. If its Exchange, then check the MailRoot and Pickup folder permissions. If its IIS check the permissions to run scripts. If its SQL check the execute permissions on the services. The solution in the printer problem below would be to change the share permissions on the HP6L printer share. In this example, the user does not have permission to install the HP6L printer. Tell the truth, an example script is not that useful with Error 800A0046 as you cannot see the permissions! When you install Visual Studio you get the following message. Once again it’s a permissions problem on the Windows\system32 folder. Another idea is to try the useful Free Permissions Analyzer. The way we got error 800A0046 was running ASP on IIS under Server 2003R2. Someone wrote a debug routine that did an OpenTextFile from a FileSystemObject; I think what happened was there were multiple simultaneous attempts to open that file. The problem was: the file is written into the sourcelocation every 10 seconds. This is done by a Closed Source Software i have no way of editing. It seems like i get the error (line 11) every time i try to READ the sourcefile while it is being written/created. I have found no way to check if the file is currently being modified except for try and error.